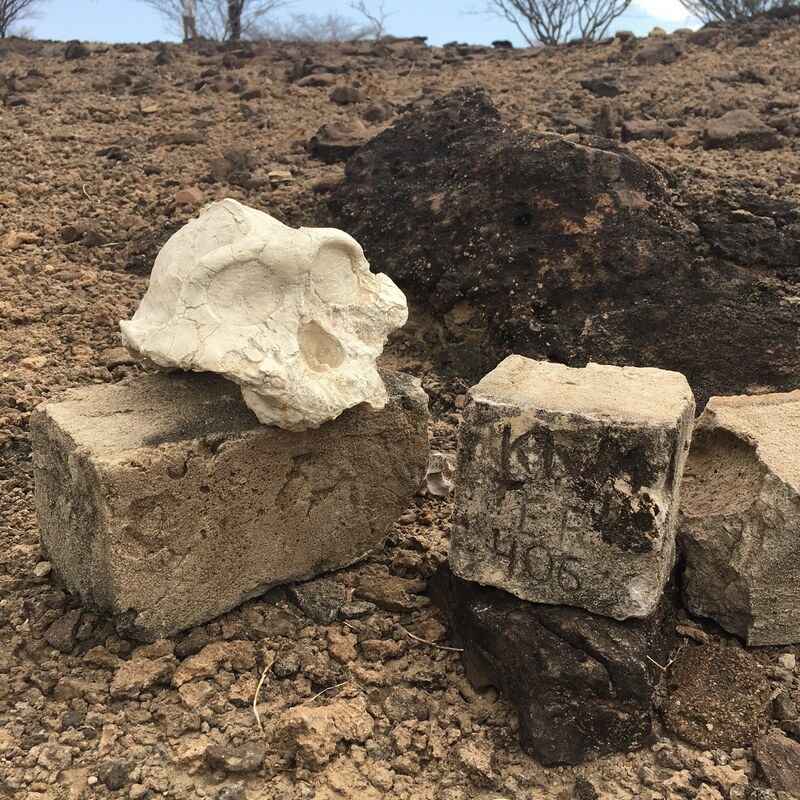 Three decades ago a vacationing couple, while walking along the west shore of Lake Turkana, saw the back end of a human skull protruding from the sand. The cranium, or upper portion of the skull, was darkly stained and heavy from the process of fossilization, which over time had filled it with additional minerals. A study by Richard Leakey and the National Museums of Kenya found this fossil to be one of the most enigmatic in the record of recent human evolution. 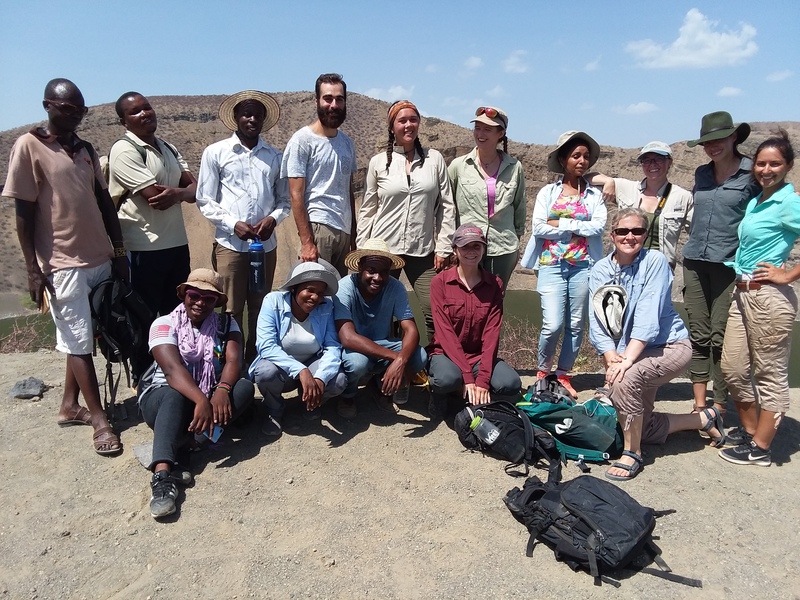 TBI Field School students, led by Cara and Meave, visited the site of its discovery on Friday to complete their field course on east African paleoanthropology. 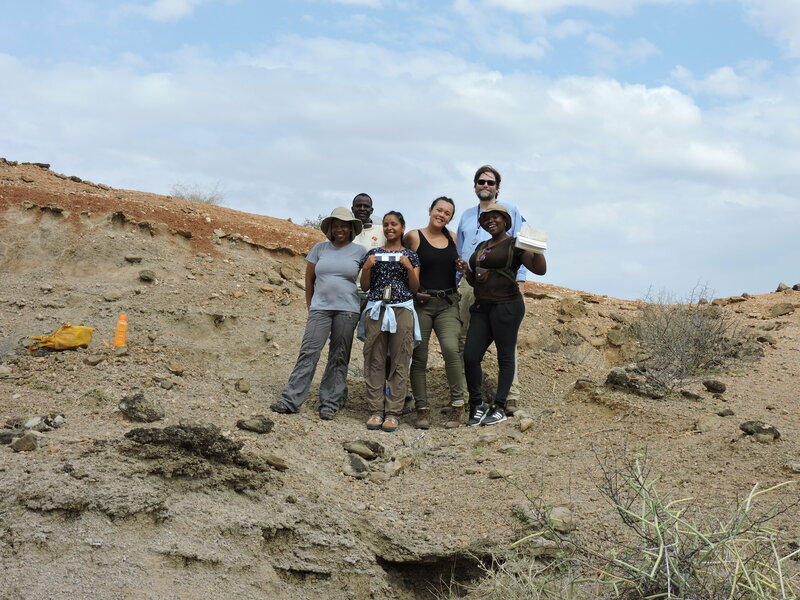 Students visited a fossil bearing site north of Eliye Springs, west of Lake Turkana on Friday to conduct a brief survey of the area and scan for further evidence of ancient human occupation. The lake shore in this region is complex geologically, and remains as yet poorly characterized. High sand and sandstone cliffs overlook the water, and were likely deposited by Lake Turkana over the last 10,000 to 1.8 million years. 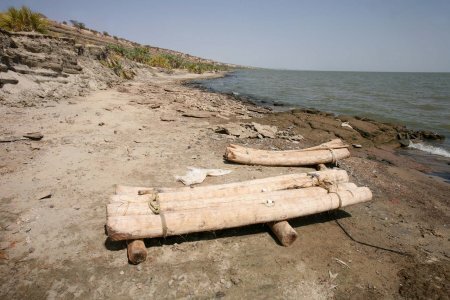 Because the lake and Turkana Basin generally are part of a geological depression, flanked by Rift Valley highlands on all sides, sediments have accumulated at a rapid rate, leading to excellent fossil preservation. 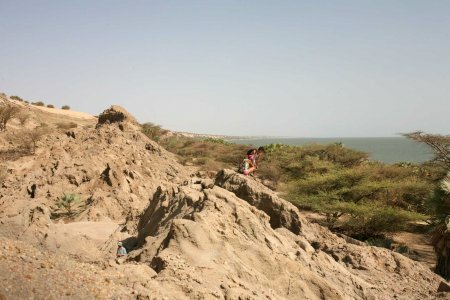 Mary and Anakoli make their way carefully beneath massive sandstone cliffs at Lake Turkana. Cara searches in the sands above Lake Turkana. Sands eroded quickly, leaving behind a rich collection of fossilized fish, crocodiles, turtles, and occasionally larger terrestrial mammals. 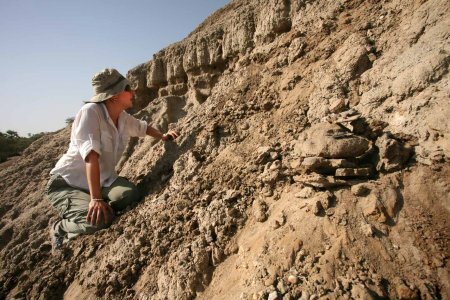 Meave examines a fossil, with Lake Turkana and Central Island in the background. TBI students find a crocodile ilium. 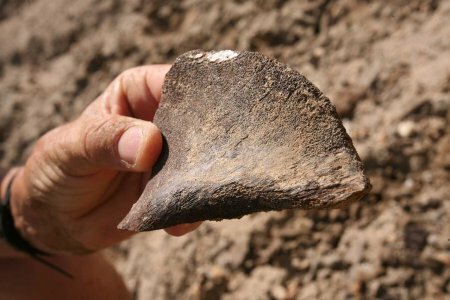 Students were ectatic to find this iliac blade, which they at first believed might belong to a human. Consultation of a manual however proved that it belonged to a crocodile. 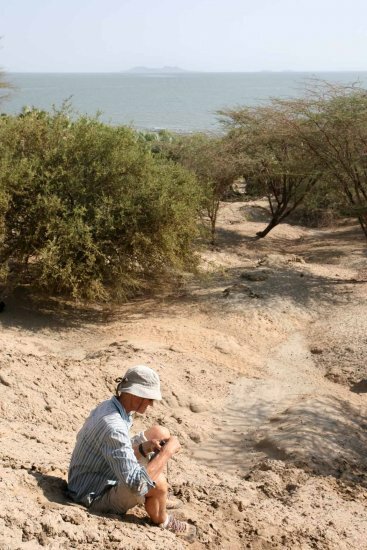 Wyatt and Priscilla hunt for fossils on a sandstone outcrop above Lake Turkana. 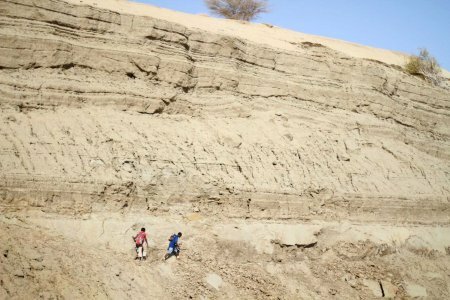 A high fortres of sandstone resists erosion as other sediments wash into Lake Turkana. 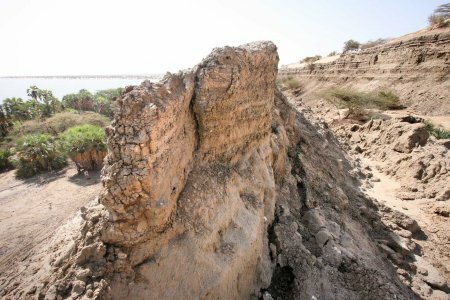 Erosion during seasonal rains and lake level fluctuations have washed away much of these holocene and Pleistocene deposits, leaving only a few cemented sandstone columns behind. When these sediments erode, fossils are exposed at the surface. 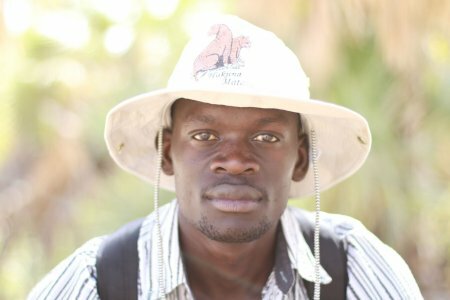 David Ndago, Kenyan geologist and TBI student, at Lake Turkana. Chelsea, Ben and Peter wade through the shallow water at Lake Turkana. As mid day approached, students hiked down to the shoreline, either searching for fossils or simply cooling down in the lake. 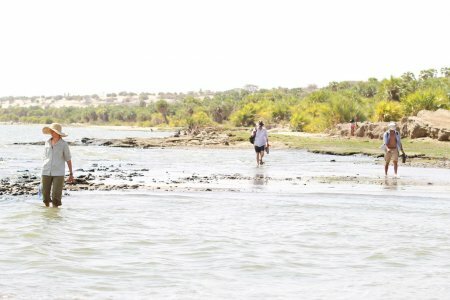 Cara walks out on a sandbank at Lake Turkana. 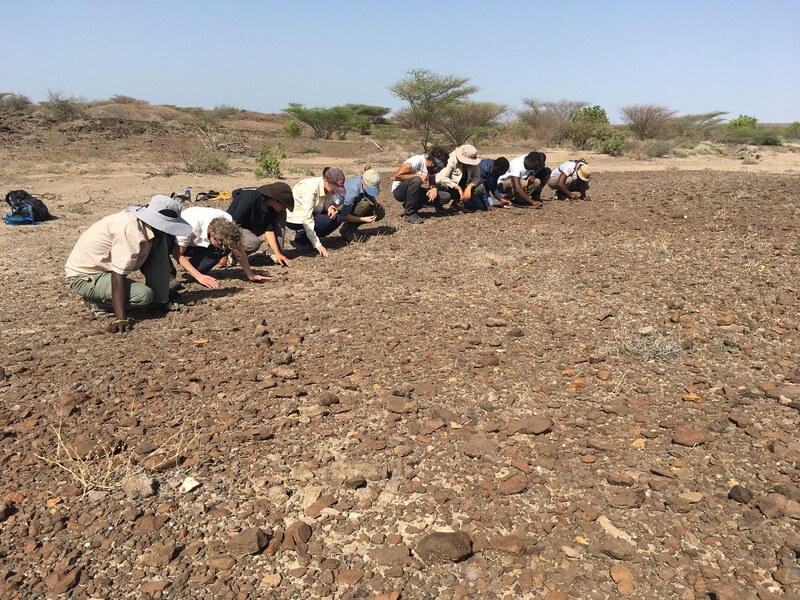 David, Alisha and Debbie kneel to examine a fossil found at the shore of Lake Turkana. Far more pleasant in the heat, the shoreline was also teaming with fossils, many belonging to large mammals including, possibly, ancient rhinos or elephants. 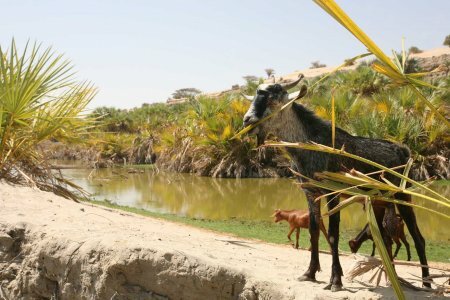 Goats come to drink at the natural springs north of Eliye, west of Lake Turkana. A goat enjoys palm fronds north of Eliye Springs. Goats, an important livelihood for many people in Turkana, can sustain themselves on almost any diet. Unfortunately, overgrazing has transformed much of Turkana, beyond the lake shore, into a sparsely vegetated desert. Fishing boats on the west shore of Lake Turkana. 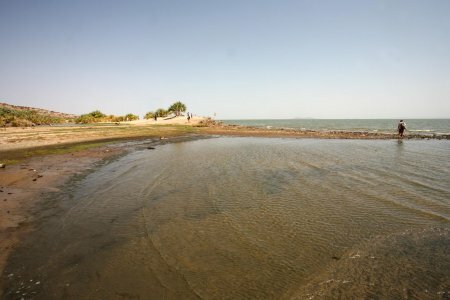 Tilapia, perch, cichlids and catfish are all important elements of Lake Turkana’s ecosystem, and the local fishing industry. 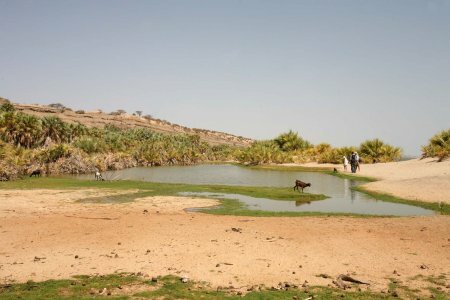 Overfishing could easily distrupt this lake’s fragile ecosystem, making it unlivable for native fish and less productive for the fishermen. Patrick, Mary and Wyatt explore a cave north of Eliye Springs. 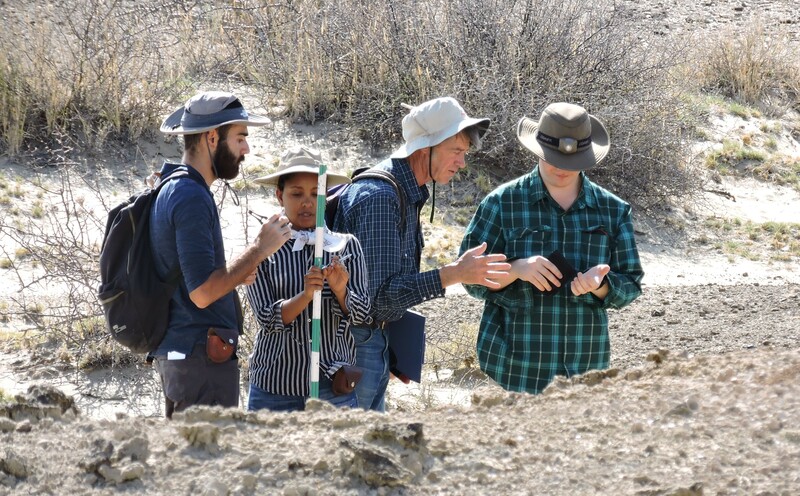 Before coming home, students returned to Pleistocene – Holocene cliffs to search for more fossils. 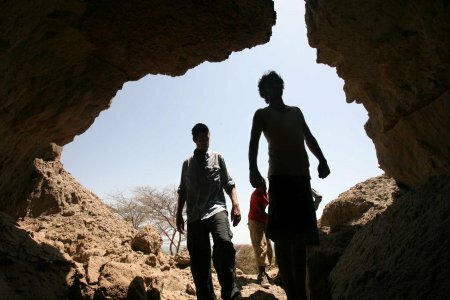 Above, students found a cave holding sediments and bones deposited in the last 10,000 years.